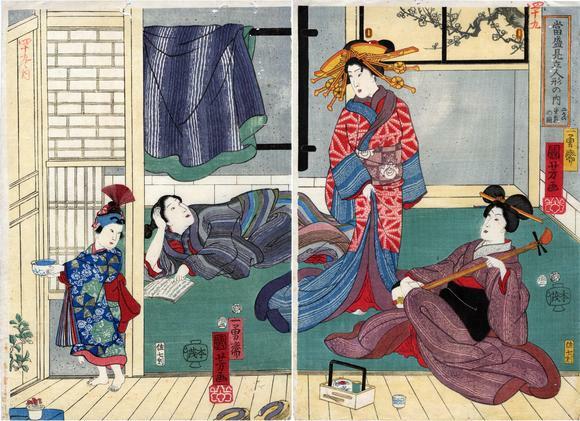 Courtesans relaxing in the 'tatami' room of a greenhouse ex B. W. Robinson collection. Prints in this series illustrate carved groups of “dolls” displayed at Kannon Temple in Asakusa. Although the word ningyō is translated as “dolls”, these lifelike dolls (iki-ningyō) were in fact extremely realistic life-sized clothed statues. This print series is listed as number 185 in Kuniyoshi by Basil William Robinson (Victoria and Albert Museum, London, 1961). There are at least five different iterations of this diptych including the work of several artists: Kuniyoshi, Toyokuni III, Yoshimori and Kunisato. In each the figures are essentially the same, but the setting is reframed slightly.